What is the best light to apply makeup in? I prefer natural light because it provides the most pure color. And that's the lighting most of the photographers I work with prefer to use. Having access to a large, bright window when applying your makeup is one of the best things you can do, but most bathrooms don't have big open windows. Fluorescent lighting is the harshest light and really distorts color. 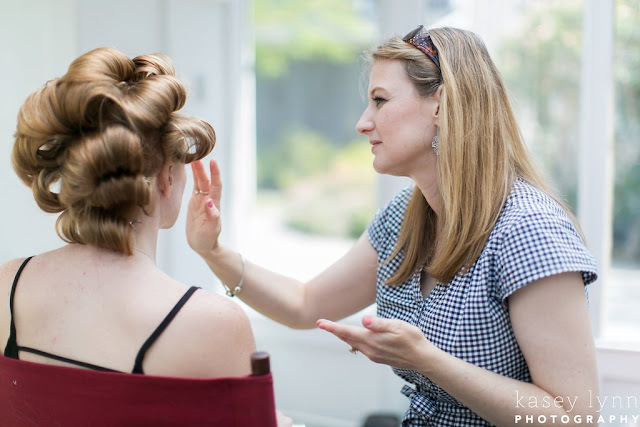 One morning I was forced to use a room with fluorescent lighting in it for my bridal clients. I had done the bride's trial run a few weeks prior and she had been happy with the results she saw in the natural day light. However, even though I used the exact same techniques and colors as we had used at the trial, she didn't seem pleased and I knew it was because of the lighting. She confirmed this when we relocated to the venue because she had seen how it looked in the natural light - thankfully, she was once again happy with her look. You have to learn to work with the lighting you have to apply your makeup, but do understand that the best light to use when matching foundations and skin tones is the natural light. Use the natural light to check for makeup blending - especially around the jaw line. Of course, special events may require different types of lighting, so be mindful of your event lighting and try to apply makeup accordingly. The photo taken above was in the conservatory at The Gardens of River Oaks. I absolutely loved having the opportunity to work in a space that had an abundance of natural light because that's the same light my model was being photographed in.